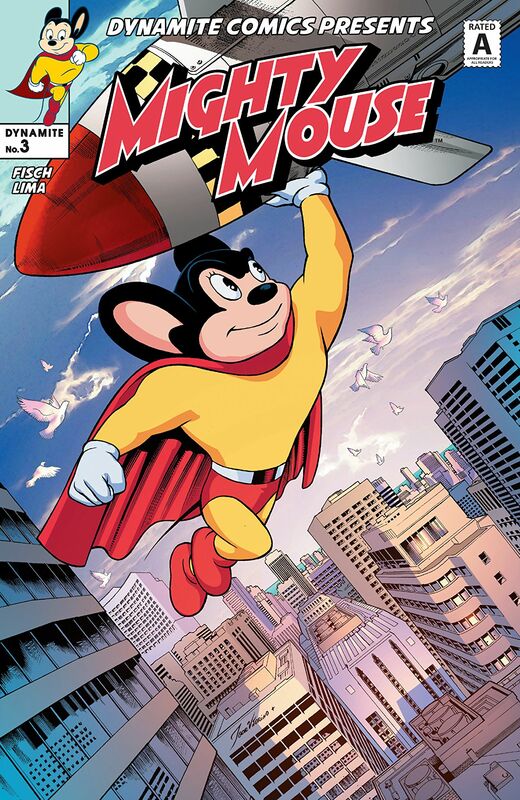 In the previous issue’s cliffhanger, as we learned that Mighty Mouse’s appearance in our “real world” is also having a surprising effect on the cartoon world that he comes from. This issue begins the next morning, as we learn that Joey and Mighty Mouse spent most of the previous night trying to think of various way to get Mighty Mouse home, including “wishing” him there. But nothing worked. Joey ends up taking Mighty Mouse to school with him (hiding Mighty Mouse in Joey’s backpack), while Joey tries to ask one of his teachers about the possibility of crossing dimensions, to no avail. Then Joey is once again confronted by the gang of bullies we saw in issue 1, but this time Mighty Mouse is there to protect Joey, and we learn that Mighty Mouse’s “cartoon physics” seem to apply in this world after all. Eventually, Joey and Mighty Mouse come to the conclusion that perhaps they should try recreating the exact events that lead up to Mighty Mouse appearing in our world. And just when they think it might be working…well, there’s another plot-twister of a cliffhanger! Once again I’m amazed at how well writer Sholly Fisch has managed to hook me on the series. I mean, it’s MIGHTY MOUSE! And I’m loving it! The interaction between Joey and Mighty Mouse is just wonderful, and I love seeing this cartoon character trying to make sense of “our world.” This issue does raise a few questions though. Surely the change in the outcome of the Mighty Mouse cartoon that we saw on TV would have caught the notice of everyone who was also watching it, not to mention the station itself? Wouldn’t that be big news? And then there’s the way Mighty Mouse took out the bullies, which is making me wonder if this entire series will turn out to just be Joey’s dream? I hope not, as that would probably feel like a bit of a cop-out. But I can’t I’ll just have to see.